Mezzanotte Night Club/Lounge (Syracuse, NY-2005-2007-Bryan Matthew Boutwell-interior designer/curator/lighting designer/artist) This photo is of the cordless L.E.D. lighting that I installed in the rafters of the ceiling. I attached the pin light sources to the pipes in the ceiling. I believe the best lighting is the lighting that people do not recognize and yet they feel. When I create an ambiance I like to hide the source of where the light is actually coming from, so that the only attention is given to the actual object the light is accentuating. I prefer to use cordless lighting apparatuses when lighting an environment so that I don’t have to worry about hiding the cords. Its much easier to change a batter once every 2 weeks and its more cost efficient. $15 a month in batteries is better than $500 a month in electrical cost. In this specific photo I chose to emphasize the art with a single pin light. 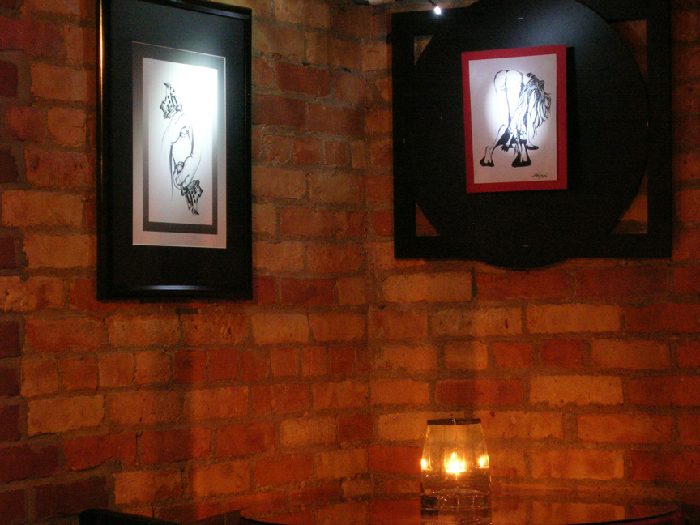 The orangey glow of the candle against the brick wall produces a warm and intimate feeling, while the bright white light on the art promotes the art in an indirect way.